RPGaDay Day #1 asks: Real Dice, Dice App, Diceless – how do you prefer to “roll”? Well, as one-half of a business that creates hand-crafted game rolls / dice bags, it seems like I would have to opt for dice right? Yes, to a certain extent, though I’m open to other possibilities. I have, for example, dabbled with a diceless approach by using cards – like the excellent Deck of Fate, Ian Millington’s superlative Dice Cards and even just a straight pack of cards when playing games of Frankenstein Atomic Frontier. I have a pack of Dan Dare cards at home that I have plans for in running a diceless pulpy sci-fi game and I also have yet to dig fully into the big-box card-driven sci-fi game Faith. I don’t really get along well with pure story games. I get it. I appreciate the challenge. I just don’t feel comfortable with that level of freeform. Of dice apps, I have tried a few – but nothing really competes with the visceral sensation of picking up a many-sided solid and throwing it across the table. I can handle dice apps and can see their place in a restricted environment or where you just don’t have any dice to hand. I use my Rory’s Story Cubes a lot when I’m improvising material – and I get the app out a lot because I don’t always carry my collection with me. With the app, I can carry a standard polyhedral set and pull the story cubes out as and when I need them. Where dice roll, I like games such as the Cypher System and Symbaroum that place them firmly in the hands of the players. I can handle that, listening to the dice falling across the table while I keep my thoughts free to consider the story and what happens next. I like that. For many games, I make my own dice – and I quite enjoy the experience. From the dice I’m throwing for the John Carter playtest at the moment to those I created for my game The Dee Sanction, I’ve made good use of the blank dice I picked up from Blank Dice. With a sheet of printable self-adhesive paper, you can print out a range of dice face and create whatever you need. 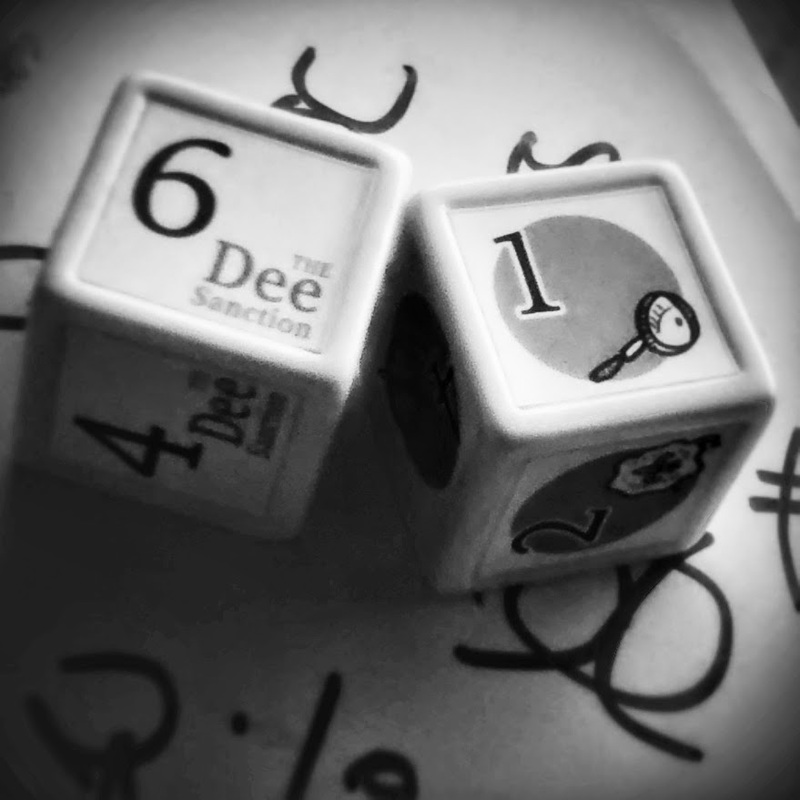 The Dee Sanction used two standard six-sided dice, but one of them had an icon next to the number – indicating equipment, the State, the Law or something similar. When the character failed a roll, they could use the icon to help narrate the cause. The rope snapped, ingrained training regimes made them hesitate, or a law-abiding citizen cried foul – the icons just offered a hook to hang the story from, which the dice determined basic success or failure. I think that boils down to my preference being to use dice, but I’m willing to experiment and tinker. I’m just not ready to throw them away completely or leave my fate in the hands of SkyNet.